The Award Winning “Reject Theatre Company” talk BOUNCERS! Michelle Ward was joined by Kevin Richard (Business Manager/Actor) and Barry Hester (Director/Actor) from THE REJECT THEATRE COMPANY. Their last production, LITTLE VOICE, was an amazing success, winning a BRENT for BEST ACTRESS IN A PLAY AWARD to the amazing Tamara Anderson. 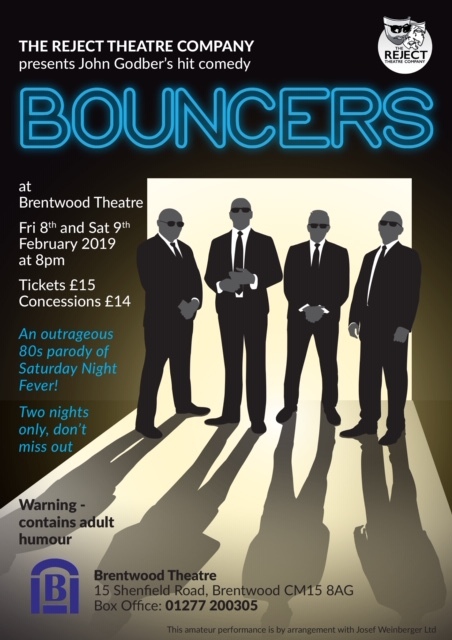 This February they are putting on a production of the hilarious comedy, BOUNCERS, an outrageous 80s parody of Saturday Night Fever! Kevin and Barry tell us more…. © Phoenix FM 1996-2019. Written using Notepad and PHP.